India put in their worst performance of the tournament to lose to Bahrain 1-0 and crash out of the Asian Cup. A late penalty converted by Jamal Rashed gave The Red all three points and sent them through to the round of 16. The result, along with Thailand's 1-1 draw with UAE meant that UAE go through as group toppers while Bahrain finished second. Thailand finished third and will find their fate out after all the other groups finish their matches. India ended their match with three points. The Indian coach Stephen Constantine announced his resignation at the press conference after the match, saying that he will move on. Needing a draw or a win to progress, the Blue Tigers started the game on the back foot as they were pegged back by Bahrain with repeated crosses into the box. ​Just after three minutes, Anas Edathodika had to be replaced by Salam Ranjan Singh after he suffered a knee injury. The Bahraini side got their first attempt on target soon as Rashed's shot from outside the box took a deflection but was palmed away by Gurpreet Singh Sandhu. The rebound was put wide. In what was India's only attempt to try a shot on goal in the game, Pritam Kotal's cross found Ashique Kuruniyan, whose wayward header posed no threat at all. 19' - @SandeshJhingan comes up with yet another excellent challenge as he slides to win the ball off the Bahrain attacker at the edge of the Indian penalty area. Sandesh Jhingan was at his best as he made a couple of great interceptions to prevent Mohamed Al Romaihi from getting a shot away. The last minute of the first half saw Bahrain threaten from a corner but Pronay Halder blocked the attempt very well. Stephen Constantine brought on Jeje Lalpekhlua for the ineffective Ashique right from the beginning of the second half. 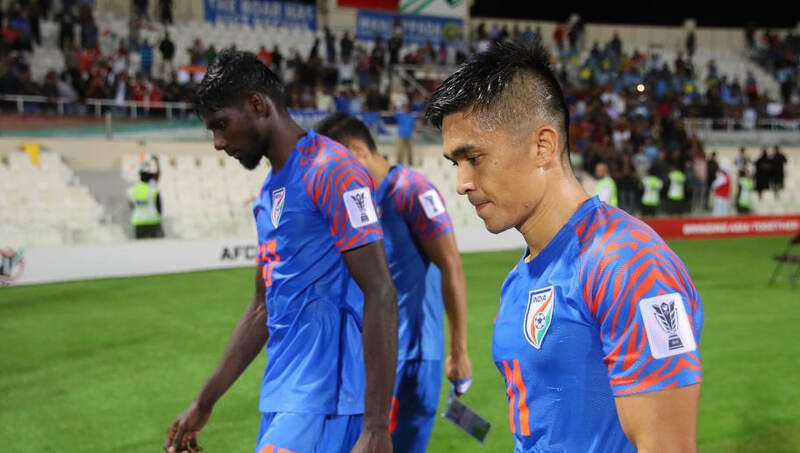 India though, started poorly again as Bahrain piled on the pressure with crosses and eventually Jhingan's intervention prevented Al Romaihi from scoring. A free-kick from Rashed was then saved well by Gurpreet. Soon after, The Red came close to breaking the deadlock as substitute Marhoon hit the post. A terrible decision from the referee ensued as he awarded Bahrain an indirect free-kick for a perceived back pass from Subhasish, when it clearly was not. India however, defended it well and prevented the goal. Gurpreet was at it again as he threw out his right hand to save a header that was destined to be a goal. Soon, he came off his line and punched the ball away from danger to prevent another clear attempt on goal. Full-time! The Indians suffer a heartbreaking defeat after an injury-time winner from the spot for Bahrain. Tragedy struck in the 90th minute as a melee in the box saw the ball come out to Al Shamsan, who was needlessly upended by Halder. The referee pointed to the spot and Jamal Rashed made no mistake from the spot to score and break Indian hearts. The man from Punjab was a lion at the back for India, making timely interceptions and stepping in to put his body on the line to keep the scores level. He was the best Indian player on the night. Despite a shaky beginning, Gurpreet made a number of good stops and marshalled his defence well. His instinctive save from a header and ability to read danger and step out was very good. After two games in which the team played very well and got their tactics spot on, Constantine deserves the criticism for the listless football the Indian team played tonight. They looked only to defend and try and attack through aimless long balls, which did nothing to help their case. The Englishman announced his resignation at the post-match press conference, bringing to an end his second spell as coach of the Indian team.